A 23 kiloton tower shot called BADGER, fired on April 18, 1953 at the Nevada Test Site, as part of the Operation Upshot–Knothole nuclear test series. The Greenhouse George test early fireball. A nuclear explosion is an explosion that occurs as a result of the rapid release of energy from a high-speed nuclear reaction. The driving reaction may be nuclear fission or nuclear fusion or a multi-stage cascading combination of the two, though to date all fusion-based weapons have used a fission device to initiate fusion, and a pure fusion weapon remains a hypothetical device. Atmospheric nuclear explosions are associated with mushroom clouds, although mushroom clouds can occur with large chemical explosions. It is possible to have an air-burst nuclear explosion without those clouds. Nuclear explosions produce radiation and radioactive debris. 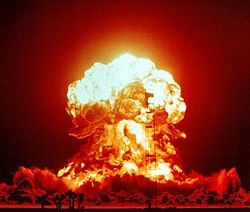 The first man made nuclear explosion occurred on July 16, 1945 at 5:50 am on the Trinity Test Site near Alamogordo, New Mexico in the United States, an area now known as the White Sands Missile Range. The event involved the full-scale testing of an implosion-type fission atomic bomb. In a memorandum to the U.S. Secretary of War, General Leslie Groves describes the yield as equivalent to 15,000 to 20,000 tons of TNT. Following this test, a uranium-gun type nuclear bomb (Little Boy) was dropped on the Japanese city of Hiroshima on August 6, 1945, with a blast yield of 15 kilotons; and a plutonium implosion-type bomb (Fat Man) on Nagasaki on August 9, 1945, with a blast yield of 21 kilotons. In the years following World War II, eight countries have conducted nuclear tests with 2475 devices fired in 2120 tests. Nuclear pulse propulsion, including using a nuclear explosion as asteroid deflection strategy. Only two nuclear weapons have been deployed in combat—both by the United States against Japan in World War II. The first event occurred on the morning of 6 August 1945, when the United States Army Air Forces dropped a uranium gun-type device, code-named "Little Boy", on the city of Hiroshima, killing 70,000 people, including 20,000 Japanese combatants and 20,000 Korean slave laborers. The second event occurred three days later when the United States Army Air Forces dropped a plutonium implosion-type device, code-named "Fat Man", on the city of Nagasaki. It killed 39,000 people, including 27,778 Japanese munitions employees, 2,000 Korean slave laborers, and 150 Japanese combatants. In total, around 109,000 people were killed in these bombings. (See Atomic bombings of Hiroshima and Nagasaki for a full discussion). Nuclear weapons are largely seen as a 'deterrent' by most governments; the sheer scale of the destruction caused by a nuclear weapon has prevented serious consideration of their use in warfare, rendering the concept of total war completely useless. Since the Trinity test and excluding the combat use of nuclear weapons, mankind (those few nations with capability) has detonated roughly 1,700 nuclear explosions, all but 6 as tests. Of these, six were peaceful nuclear explosions. Nuclear tests are experiments carried out to determine the effectiveness, yield and explosive capability of nuclear weapons. Throughout the 20th century, most nations that have developed nuclear weapons had a staged test of them. Testing nuclear weapons can yield information about how the weapons work, as well as how the weapons behave under various conditions and how structures behave when subjected to a nuclear explosion. Additionally, nuclear testing has often been used as an indicator of scientific and military strength, and many tests have been overtly political in their intention; most nuclear weapons states publicly declared their nuclear status by means of a nuclear test. The dominant effects of a nuclear weapon (the blast and thermal radiation) are the same physical damage mechanisms as conventional explosives, but the energy produced by a nuclear explosive is millions of times more per gram and the temperatures reached are in the tens of megakelvin. Nuclear weapons are quite different from conventional weapons because of the huge amount of explosive energy they can put out and the different kinds of effects they make, like high temperatures and nuclear radiation. The devastating impact of the explosion does not stop after the initial blast, as with conventional explosives. A cloud of nuclear radiation travels from the epicenter of the explosion, causing an impact to life forms even after the heat waves have ceased. Any nuclear explosion (or nuclear war) would have wide-ranging, long-term, catastrophic effects. Radioactive contamination would cause genetic mutations and cancer across many generations. ^ U.S. Department of Energy. "Trinity Site - World's First Nuclear Explosion". Energy.gov Office of Management. Retrieved 23 December 2016. ^ Taylor, Alan (July 16, 2015). 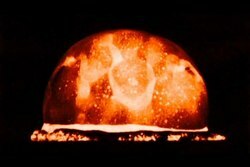 "70 Years Since Trinity: The Day the Nuclear Age Began". The Atlantic. Retrieved 23 December 2016. ^ Groves, General Leslie (July 18, 1945). "The First Nuclear Test in New Mexico: Memorandum for the Secretary of War, Subject: The Test". United States War Department. PBS.org. Retrieved 23 December 2016. ^ Malcolm Fraser and Tilman Ruff. 2015 is the year to ban nuclear weapons, The Age, February 19, 2015. This page was last edited on 22 April 2019, at 07:24 (UTC).